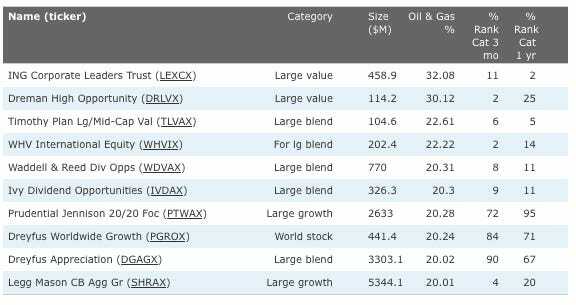 Will High Oil Prices Keep These Funds On Top? The recent antigovernment protests in Egypt have put a spotlight on oil prices. After falling below $70 a barrel in the spring of 2010, the price of oil has crept upward in recent months due to the stabilizing economy and increasing demand. The protests in Egypt caused it to spike to higher than $90 a barrel last week over fears that the unrest could spread to other Middle East countries and disrupt oil supplies. Oil prices have since eased, but the futures markets indicate that many people still expect further increases. If there’s another sharp upward spike like the one in 2008’s first half, when oil almost hit $150 a barrel, it could put a damper on the still-tentative economic recovery. One area of the market that benefits from higher oil prices is energy stocks, especially firms involved in oil exploration and drilling. The average energy stock gained 12.6% during the last three months, the second-highest gain out of the 12 Morningstar sectors. Oil-services stocks have been among the market’s bright spots lately, with big names such as Halliburton, Baker Hughes, and National Oilwell Varco all gaining more than 30% since early November. Big, integrated oil firms such as ExxonMobil and Chevron have gained 15% to 20% during this time, outpacing the S&P 500. In the fund world, the direct beneficiaries of this trend have been energy-sector funds such as Fidelity Select Energy Service and exchange-traded funds such as iShares Dow Jones US Oil Equipment Index, both of which are up around 50% over the last year. Quite a few diversified funds with big energy holdings have also benefited. The following table shows the diversified mutual funds with the biggest combined percentage of their portfolio in three industries: oil and gas equipment and services, oil and gas exploration and production, and integrated oil and gas firms. It also shows each fund’s size and its percentile ranking in its category during the past three months and the past year, as of Feb. 10. Most of these funds have done very well recently. Seven of the 10 rank in or near their category’s top decile during the past three months, and in the top quartile during the past year. Their energy exposure has certainly helped, but so have big weightings in cyclical stocks, many of which have posted big gains as the recovery gains steam. For example, WHV International Equity has a combined 86% of its portfolio in energy and industrials, with nonenergy commodity firms Potash Corporation of Saskatchewan and Rio Tinto among its biggest gainers during the last year. Similarly, Dreman High Opportunity’s top five holdings include Anadarko Petroleum, Devon Energy, and Chesapeake Energy, but its top 10 also includes BHP Billiton and Eaton, which were up 43% and 83%, respectively, in 2010. Waddell & Reed Dividend Opportunities and National Oilwell Varco as its top two holdings, but the rest of its top five — Microchip Technology, Deere and Union Pacific — are cyclical stocks with big recent gains. Three of these funds have been laggards over the last year despite their energy holdings. In the case of Prudential Jennison 20/20 Focus managers Sig Segalas and Dave Kiefer prefer high-quality, growth-tilted large caps, which have not been in favour in the last year. It’s a similar story at Dreyfus Worldwide Growth and Dreyfus Appreciation. Both are subadvised by a team at Fayez Serofim that primarily holds wide-moat mega-cap stocks, which have had a tough time keeping up during a year when smaller, riskier fare had the best returns. For the most part, though, holding a lot of oil and gas-related stocks has been a winning move in the last year, especially when paired with a heavy weighting in cyclicals. Whether this will continue to be a winning strategy depends on a lot of factors, including the price of oil as well as the strength of the overall economic recovery.